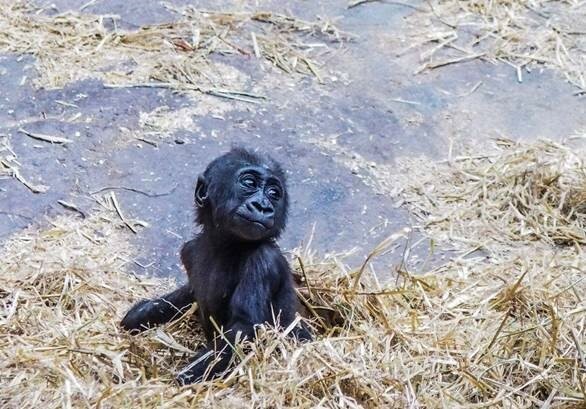 The smallest gorilla at the Calgary Zoo is a year old, and we can’t wait to celebrate! Our Western lowland gorilla troop has had an eventful year with the birth of young Kimani, the first baby gorilla to be born at the zoo since 2008. In the span of a few months, family member Zuri experienced health issues and the troop lost their patriarch- older silverback Kakinga. While each of these events took time for the troop to adjust, the zookeepers were delighted with how well the troop managed. Kimani’s arrival was met with great enthusiasm from zoo fans, and visitors flocked to the zoo to catch a glimpse of this curious little ape. She had a slow start, gaining weight less quickly than veterinarians would have liked. She is now a healthy 5.9 kilos partially as a result of the tender care from mother Kioja as well as the expertise from our Animal Care and Veterinary Teams. While she is still little for her age, the staff are thrilled with her progress, and are pleased to see her learning and exploring every day. Kimani delights in riding on mom Kioja’s back and has started eating some solid foods. She has taken to play behavior with the other females in the troop—Dossi, Yewande and Zuri. This play behavior within the troop is an excellent sign of long-awaited troop contentment. As there are fewer than 55 breeding recommendations granted for the western lowland gorilla captive population, Kimani has been an important addition to the Species Survival Plan (SSP) and certainly to our troop. Take a look back on when Kimani was born. 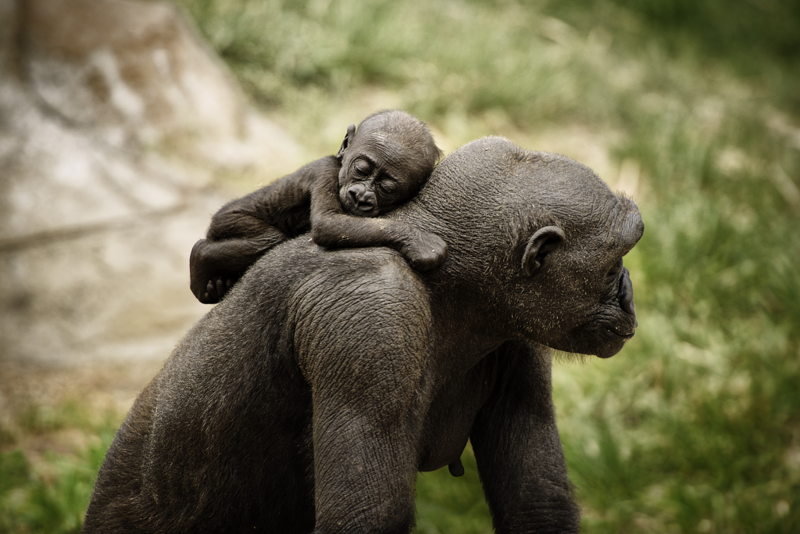 Looking to help offer your support to our gorilla troop and gorillas in the wild? 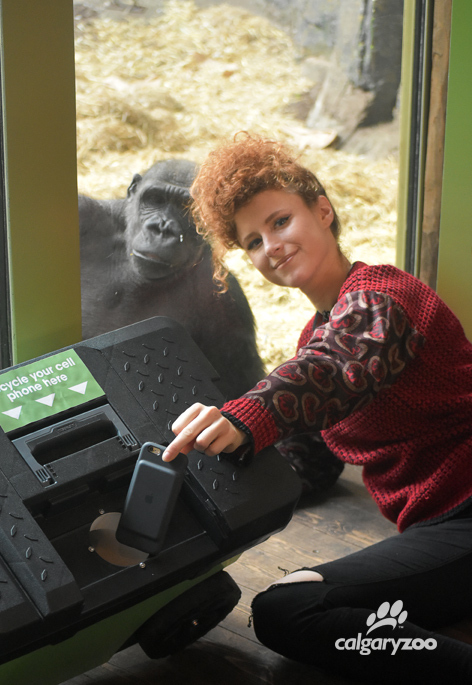 Recycling your old cell phones is just one way that we can all lend a hand in preserving the habitat for these amazing primates. Each home in North America has an average of 3-4 cell phones, unused, waiting to be recycled. When cell phones are recycled, not only do we prevent noxious chemicals from leeching into landfills and our groundwater, but a mineral used in the creation of a small mineral chip found in every cell phone is also recycled. This mineral is coltan which is mined in areas where gorillas live. When cell phones are recycled, so is the coltan which means that gorilla habitat is preserved. For more information on our cell phone recycling program, click here. Visit the interior gorilla habitat in the TransAlta Rainforest at 2 p.m. to help mark this special occasion. Kimani and the rest of the troop will be receiving special festive enrichments, and there will be treats for the human attendees as well…as long as you help us recycle! Visitors that bring a used cell phone to recycle will find themselves with a yummy party favour! 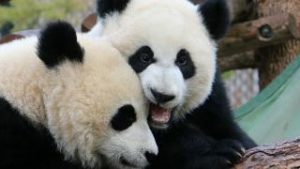 Membership fees and admission to the zoo go toward feeding and caring for our animals, enhancing the facilities, and supporting our local and global conservation efforts to protect species at risk. Thank you for your support.